Inkmaker has chosen Pneumax as partner for the pneumatic automation thanks to its broad and technologically advanced production range. 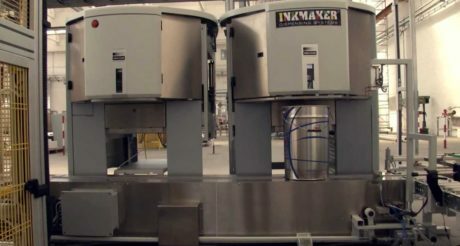 The company Inkmaker was established in Italy, in Turin province, in 1987 and operates in the production of dispensing systems: industrial machines that allow paint and ink producers, as well as big mould and die makers, to reproduce exactly the same colour shade at the wished time. In its offer, Inkmaker proposes small, medium and big dispensing systems, water-and solvent-based (ATEX). Each system is designed according to customers’ requirements, considering the volumes a machine can treat, the available space, the customization needs that can consequently change, as well as the available options. 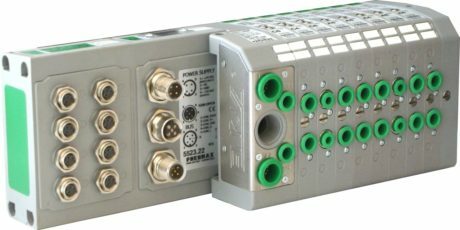 The collaboration with Pneumax, reference player in the survey of components for industrial automation, started in 2010 for the design of some plants: today, thanks to the positive results reached, the partnership continues with mutual satisfaction. Numerous Pneumax products are used, mainly “Nova” valve and solenoid valve packs, pressure regulators, pneumatic distributors, pneumatic fittings and electronic proportional pressure regulators. The advantages, which lead Inkmaker to turn to Pneumax as supplier, are reliability, quality/price ratio and the service level (both of technical nature, due to the competence of the team working onsite, and of logistic kind) the Turin subsidiary can offer. 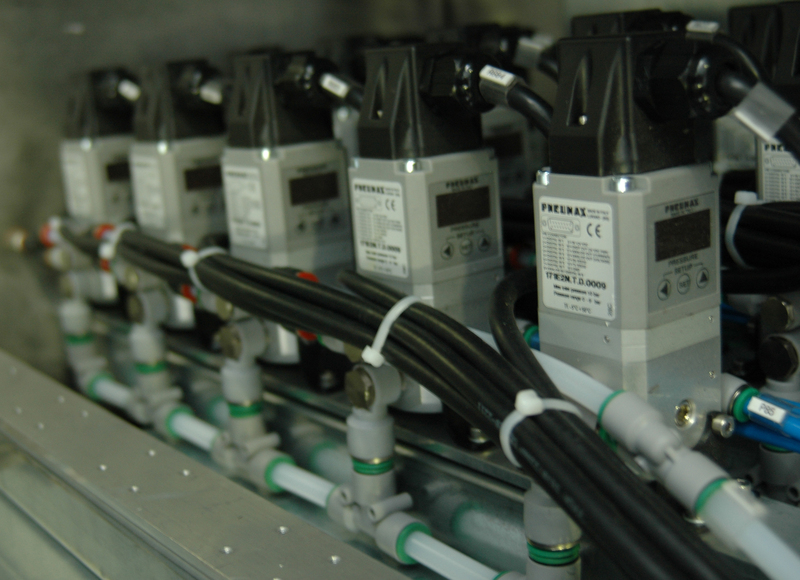 Currently Inkmaker is implementing a multi-head and multi-user ink dispensing plant by making use of Pneumax proportional valves to manage the pump pressure, through analogue outputs that determine their speed. A net of PLC Siemens s71500 manages the operation priority and speed at which pumps must work depending on the user who is operating them. The product innovation characterizes the history of Inkmaker. Along the years, they have introduced completely new technologies to dispense inks and paints, therefore the primary intention is to go on pursuing this way: a course made of diversification and constant research that will lead the company to explore new application sectors, including the cosmetic, oils and fuels and pharmaceutical ambits. Currently, they have planned the investment of huge resources in R&D ambit, with the target of further improving the machine quality and efficiency. For the future, they are studying a new integrated technology, which provides for the introduction of robots on dispensing plants, to implement their productivity and the production flexibility. Moreover, Inkmaker intends to provide a complete design and construction service to grant the implementation of new manufacturing sites and upgrading projects, with the aim of decreasing costs and rising the manufacturing efficiency. Among the various solutions supplied by Pneumax to the Turin company, stands out the line of Enova® valves: each single element integrates all functions, both electrical and pneumatic, needed to make up a group of solenoid valves. Among the various solutions supplied by Pneumax to the Turin company, stands out the line of Enova® valves: each single element integrates all functions, both electric and pneumatic, needed to make up a group of solenoid valves. There are no limits in setting up the configuration of the solenoid valve isle, freedom is left for end users’ requirements; the addition or the removal of modules occurs in very simple and fast manner. 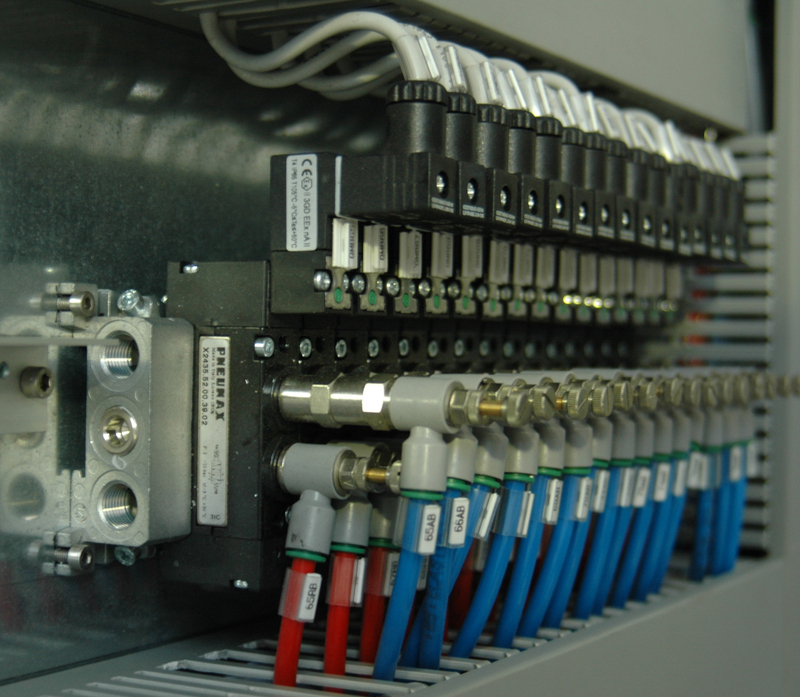 Electrical connections are implemented through a 25-pole connector that can manage 22 solenoids in all. Both electrical and pneumatic connections are positioned on a single module at the isle extremity. The series of ENOVA® valves. Still with the same user friendliness, it is possible to integrate a serial node that is available in the most common communication protocols. The solenoid valve isle is composed by single elements that integrate both pneumatic ducts and the transmission system of electric signals. Pneumax has hugely invested in the latter to achieve a product with low economic impact and high technological content. The result has been a multitasking electric connector for which they have then registered an industrial patent application. 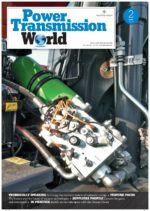 A high-performance technopolymer has been widely used to optimize manufacturing processes and, once more, to decrease the final cost of the product. Other aspect worth highlighting in the technopolymer use is the lightness achieved in the final product; these solutions, in fact, thanks to their small size, are often devised to be installed on moving machine parts and consequently, the weight reduction always implies some benefits. Actually, there are no limits in configuring the solenoid valve battery apart from the maximum number of electro-pilots that can be managed in all (max. 22 solenoid valves on each battery). They have provided for 13 different valve functions (5/2, 2×3/2, 2×2/2 etc.) and 3 use connections (Ø4, Ø6 and Ø8), all in a single thickness of 12.5 mm and a nominal flow rate of 700 Nl/min. They have provided for the possibility of adding, directly on board of the battery, a serial node based on the most widespread communication protocols. The provided protocols include Can-Open, Profibus-DP, AS-Interface and Device-Net. As completion of the integrated solution, there is then the possibility of adding expansion modules for the management of inputs and, depending on the protocol, it is possible to succeed in managing up to 24 inputs (3 consecutive modules with 8 inputs each). The entire connection among the elements directly occurs without the aid of external cables, granting the IP65 protection degree. The company Inkmaker was established in Italy, in Turin province, in 1987 and operates in the production of dispensing systems. Inkmaker is present in various sectors such as printing, inks, offset/UV inks, industrial painting, paints, rotogravures, car finishing, marine and aeronautical coatings, wood coatings, cosmetics and pharmaceutical. The company operates worldwide, it relies on a second manufacturing site in Shanghai and on some subsidiaries in North America, South America, Asia and Australia, realities that allow offering not only products but also an efficient and punctual after sale service. The turnover of Inkmaker is subdivided into two halves: 50% for paint and 50 % for the ink market; besides, it can boast 90% of export, mainly in Turkey, Russia, Argentina, Brazil, Colombia, North America, France and Morocco. The product range is studied to satisfy all kinds of demands, concerning the preparation of different ink shades, paints (water-or solvent-based), adhesives and so on. Almost 2,000 installations in the world guarantee the quality and the efficiency of Inkmaker dispensing stations; these are constantly upgraded thanks to a skilled team who directly develops each project at their headquarters.